Other Homepage Blocks For the Static Front Page of Default Template. 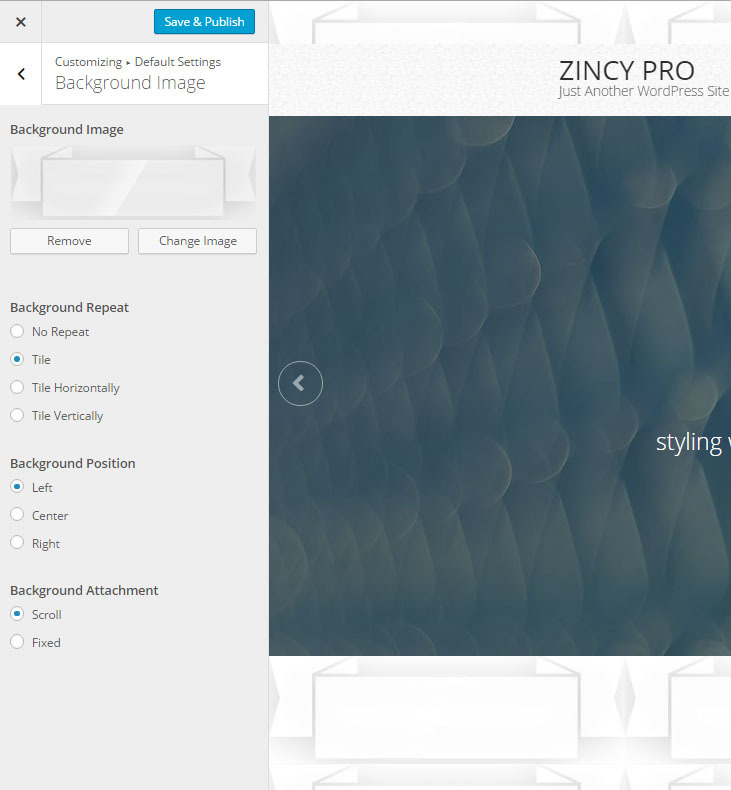 Zincy Pro is a powerful & feature-rich business theme. It comes up with customizer panel which allows you to live preview your changes, configurations, settings and design! It is super user friendly, lightweight and saves a lot of setup/configuration time. Features include: access to Google Fonts, layout control, logo/fav icon upload, category slider, normal and 3d effect in navigation, blog layout, testimonial, portfolio, several page and post layout and much more. Compatibility: all major browser, fully responsive, WooCommerce, bbPress and all major plugins. Others: Translation ready, SEO friendly, RTL support. 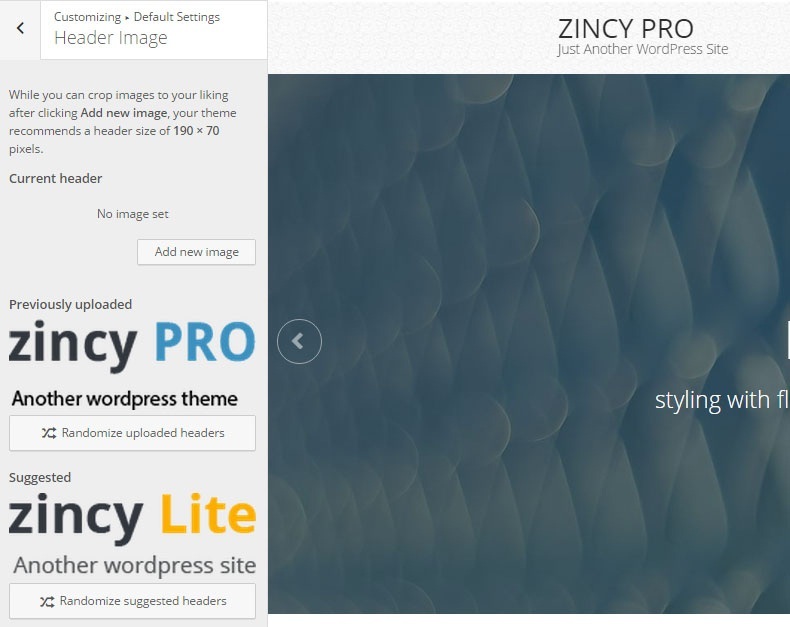 Thank you for purchasing Zincy Pro theme. If you have any questions that are beyond the scope of this help file, please feel free to email at support@8degreethemes.com or to my support forum at https://8degreethemes.com/support/forum/zincy-pro/ . Thank you so much! 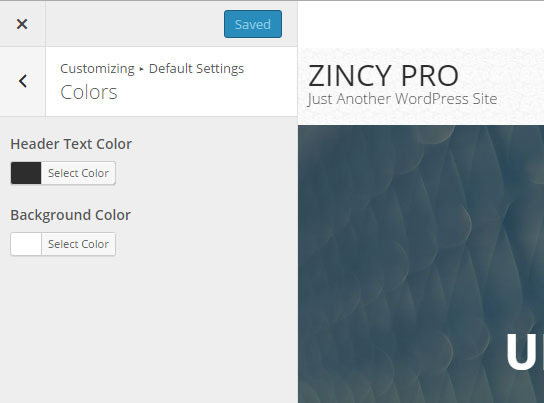 Get a copy of Zincy Pro Theme. Click on "Upload Theme" button at the top and browse the .zip file. 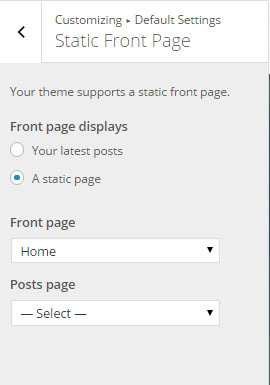 Click on Appearance>Customize in Admin Dashboard panel for further setup of the theme. 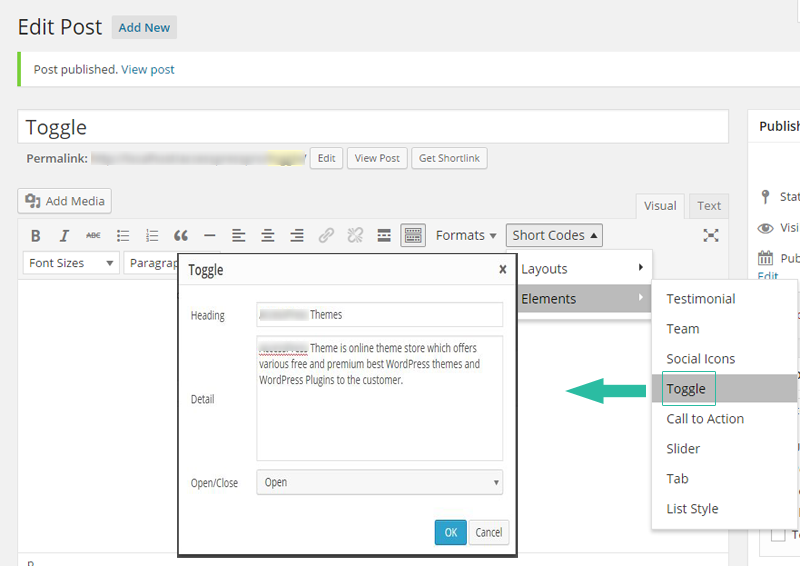 Now, activate the theme by going to Appearance > Themes in the wordpress dashboard. 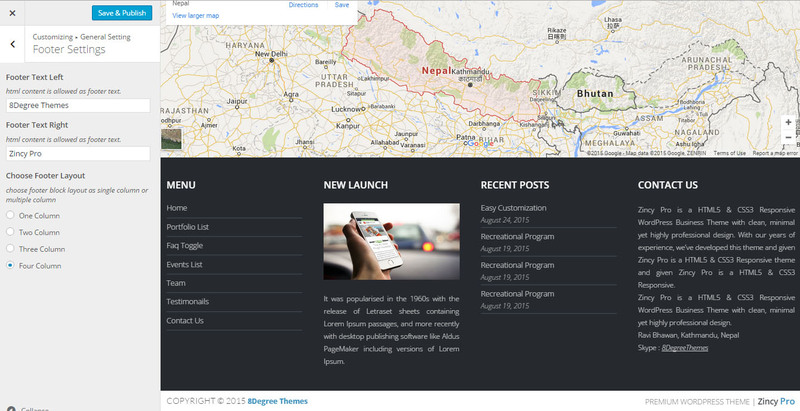 This theme provides a 'Home Page' template for your home page. Please follow these steps to configure your home page with 'home page' template. Choose Site Title and Tagline for your site instead of logo image. 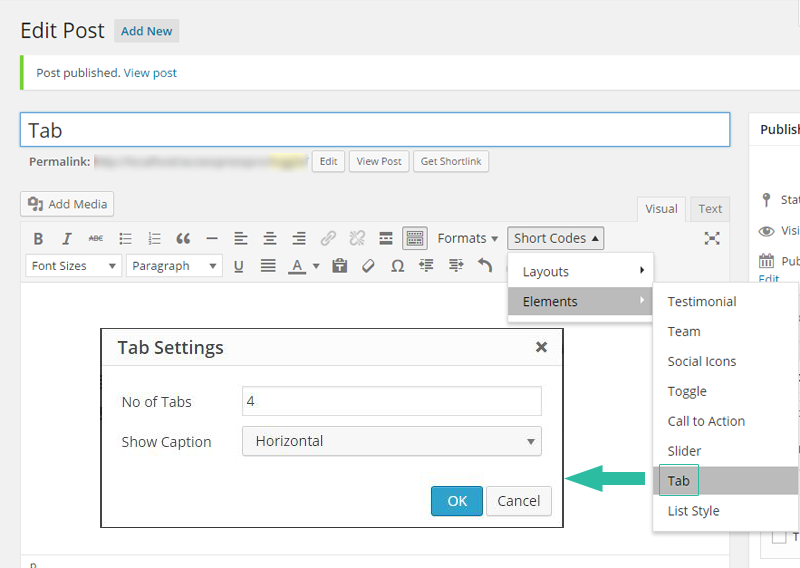 Check "Display Header Text" to enable Site title and Tagline. Choose Site Icon (Favicon) for both backend and frontend. NOTE: Hide Header image to show site title and tagline as header text instead of logo. Choose "Header Text Color" to change the color of "Site Title" and "Tagline". Choose "Backgorund Color" to change the color of the theme background. Click on "Add new image" to upload logo. You can add padding for the logo from the options available there to put values. NOTE: Adding logo/header image replaces the header "Site Title & Tagline". Click On "Select Image" to add background image of the theme. NOTE: Using "Background Image" replaces the backgorund color of the theme. Choose between "Your Latest Post" and "A Static Page" to show as frontpage. 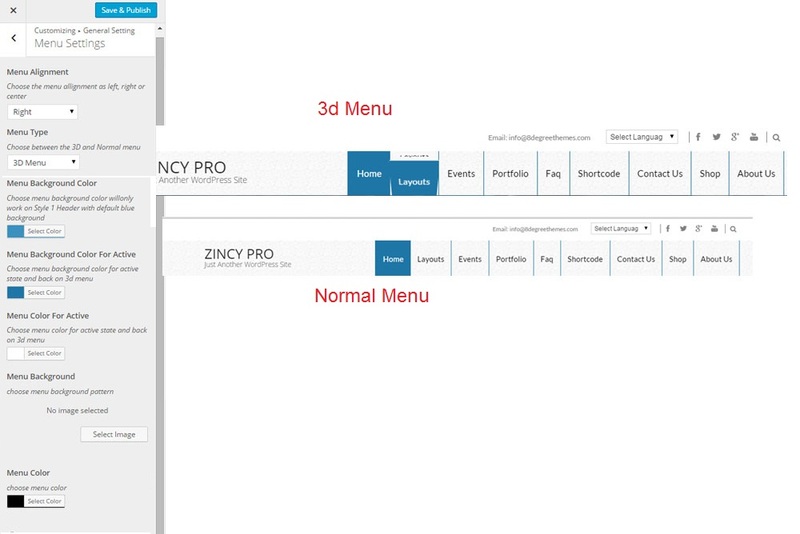 To show the default homepage as in the demo you need to create a page and assign its template to the provided Homepage template and select the same page as Front Page from the options dropdown. ​Go to ​Admin Dashboard > Appearance > Customize > General Settings. 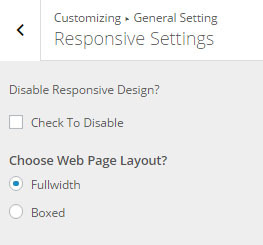 Select "Full Width" or "Boxed" Layout for your site form 'Website Layout Option" as per your requirement. Show Search Box in Header? Check to enable the search box in header as shown in image above. Click on "Upload Image" to upload favicon for your site.Upload favicon image of size 16px * 16px. Note: This will work if the default site icon is not added from Site Identity section above. ​Input desire text in textarea to dispaly in header of your site, as in above image, html content is allowed as header text. 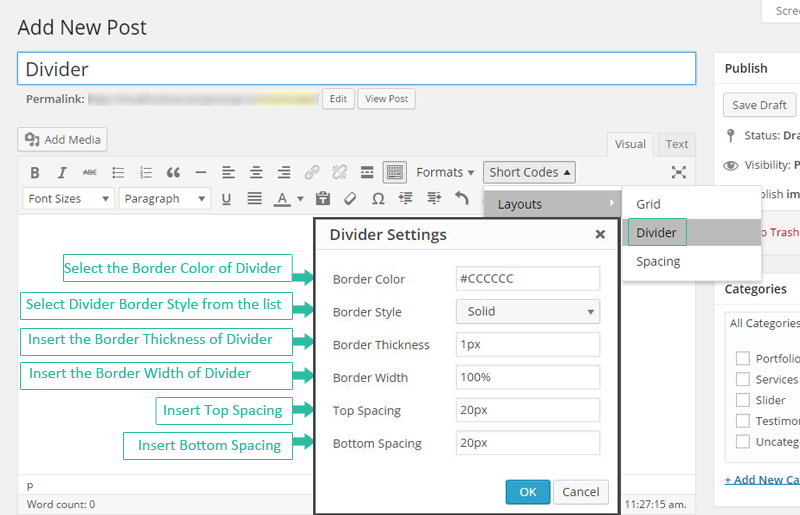 ​Select different header layouts from availabel dropdown of four layouts. Choose the menu alignment from the dropdown as right, left or center which suits your website. Choose the menu type from available 3D & Normal menu. Add navigation padding from top if required on the available field. Check to enable feature image in the post details page. Check to enable post date and author in post details page. NOTE: "Details page/post settings" option are for the post details page only, add post feature image to see the use of these settings. Input the text to dispaly as footer content (left and right), html content is allowed as footer text. 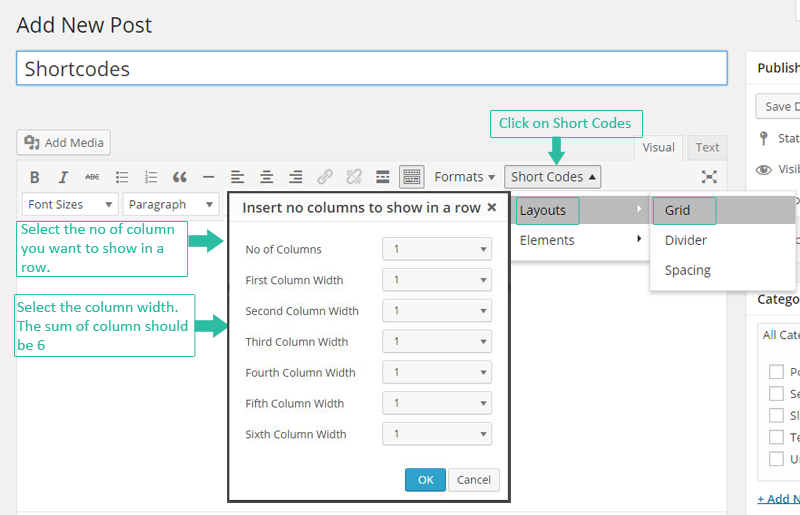 Choose footer layout to show different columns from the available options. CLICK ON "Save & Publish" TO SAVE "GENERAL SETTINGS". ​By default slider dispaly in homepage if you don't want to show slider in homepage, "Check to disable" the slider. ​Choose Yes/No to show/hide the slider pagination. ​Choose Yes/No option to show/hide the slider control arrow in left and right of the slider. ​Choose between the fade and slide for the slider transition settings, you can live preview within customize. ​Choose the option Yes/No to auto slide the slider in homeopage selecting the "Yes" option auto slide the slider in homepage. ​Choose the integer value for the slider sppeed to slide or fade. ​Choose the integer value for the slider pause time between the two slides. ​Choose Show/Hide option to show the text above the slider. Slider caption are the post title and the description. ​Choose between Enable/Disable option to show or hide the slider overlay above the slider, please preview in customize view as a live changes. ​Select Enable/Disable to show or hide the overlay beside the slider text. ​Choose the clolor from the color selector as a slider text overlay color, check the work function in customizer view to select the desire color. ​Choose banner type between the single post as a sider or category a post as slider. Single Post as a Slider - Selecting this option allows us to choose the single post as slider. Cagetory Post as Slider - Selecting this option allows us to choose the category as slider and its asscoiated post as banner of the slider. Assign maximum of four post as slider in the select dropdown (Choose Slider 1, 2, 3,4) under this menu. 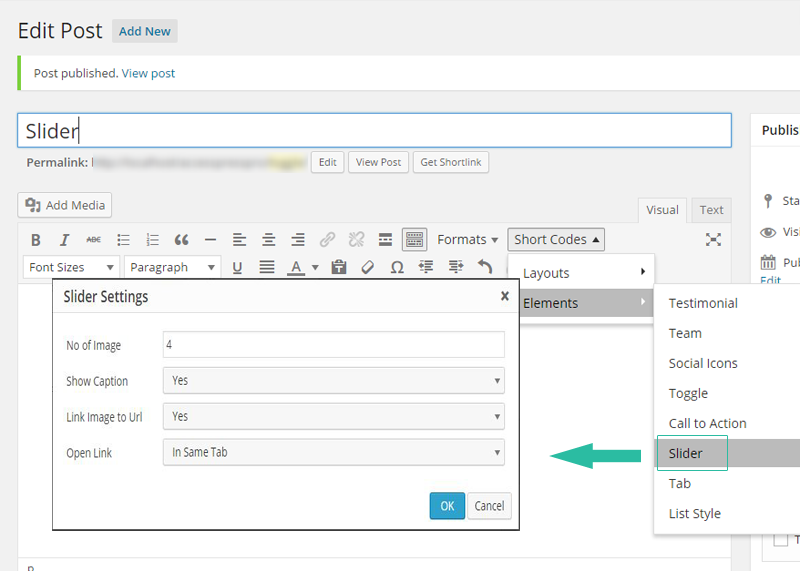 NOTE: "Single Post as a Slider" under "Banner Settings" must be selected to assign single post as slider.Post title & description is shown as slider caption and feature image as the slider background image. Choose the category from the dropdown as slider, its assocaited post is shown as the banner. NOTE: "Category Post as a Slider" must be selected to show the category post in homepage. Post title & description is shown as slider caption and feature image as the slider background image. CLICK ON "Save & Publish" TO SAVE "SLIDER SETTINGS". Check to enable the block. Select the category to show the posts of in this block. ​Select the post from the dropdown as the welcome post below the slider. Check the below checkbox to show the welcome post content as a full content. ​Select the number of character to display as welcome post character, uncheck the "Check To Enable Full Content" to use the excerpt character option. ​Choose the read more text to display read more option in welcome post, leave empty if you don't want to showread more text in welcome post. Font awesome Icon For Featured Post? ​Check to Enable Small Icon - If enabled the feature image will be replaced by small font awesome icon. ​Choose the post from the dropdown to show as feature post. Follow same for other featured posts. ​Input appropriate read more text to show below each feature post.Leave empty if you don't want to show read more in feature post. Go To Customizer > Portfolio Settings and make different settings for this section. ​Check to Enable team member section. Posts will be fetched from the Team custom post type available in the sidenav of admin. 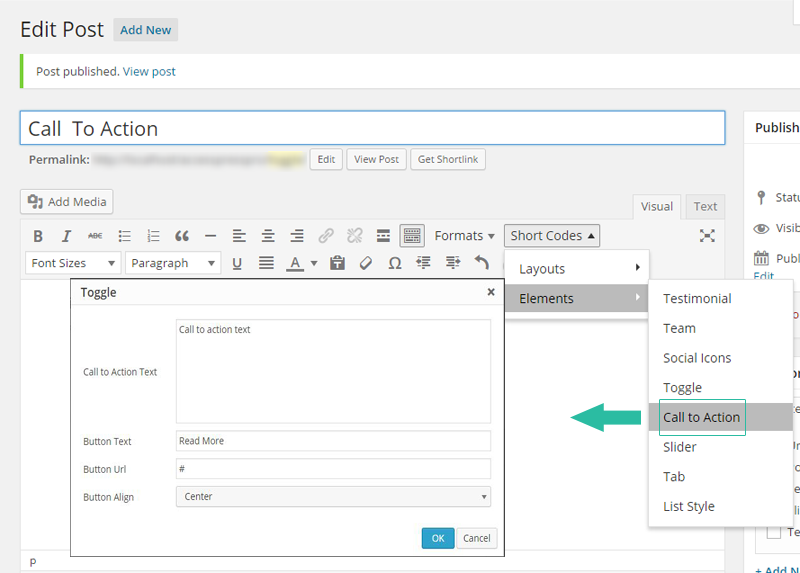 ​Input appropriate text in the textarea to show as "Call to Action" text below the feature post block, html content is allowed as the call to action text. ​Choose the appropriate text for the read more button in "Call to Action" block. ​Input the url for the "Call to Action" link. Check the bottom checkbox to enable this section in inner pages. 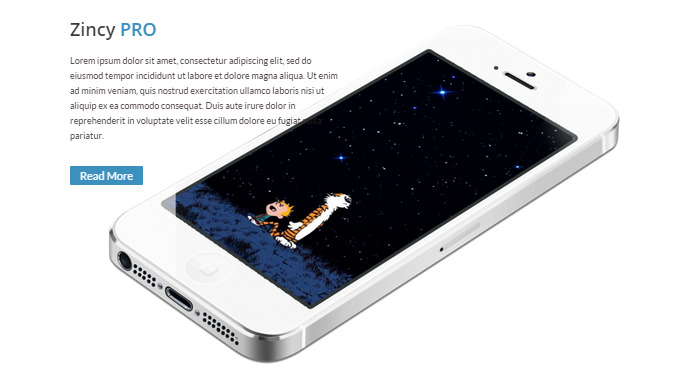 ​Input the gallary shortcode as in example to show the gallary in the block above the footer. Click on the provided link to add logos for client/partners or go to Logos Custom Post Type from admin side nav. Find the Widget titled "Footer Google Map" and add iframe code to it for this section to have google map. CLICK ON "Save & Publish" TO SAVE "HOMEPAGE SETTINGS". ​Check to enable social links in the header as in figure above. NOTE: Leave empty if you don't want to show the particular icon in the header. Similar process for other social icons to show or hide in header. CLICK ON "Save & Publish" TO SAVE "SOCIAL LINKS SETTINGS". Select the sidebar to show in the faq pages. Note: Only right sidebar can be enabled in the Faq Pages. So, please make sure to select the same on the page while creating it from Pages. CLICK ON "Save & Publish" TO SAVE "FAQ SETTINGS". Select the widgetd to show in sidebar to show in the event pages. Chose the view type list/grid in event page. Enter Number of excerpt character to show in short description. CLICK ON "Save & Publish" TO SAVE "EVENT SETTINGS". Enter Text for the view all button. Choose the widget to display in right sidebar if active in posts. Choose the widget to display in left sidebar if active in posts. Check to Show social sharing link. 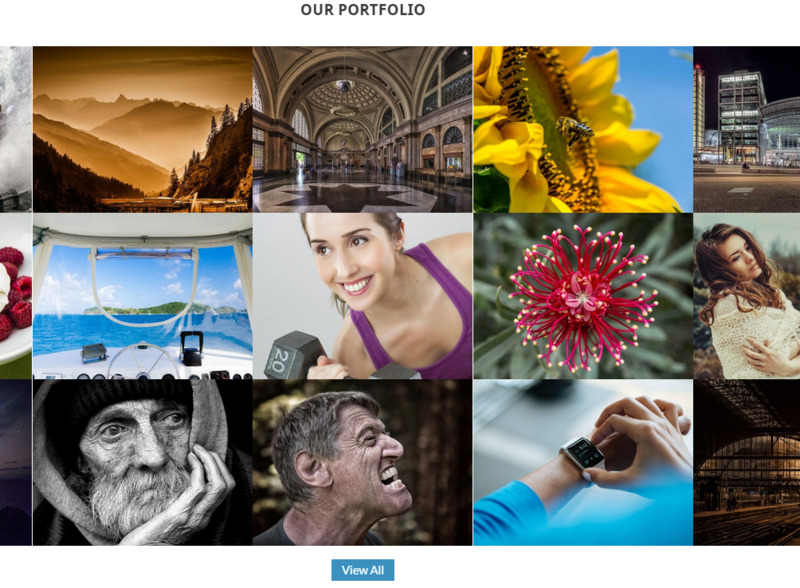 CLICK ON "Save & Publish" TO SAVE "PORTFOLIO SETTINGS". From Here you can add,edit,delete menus and their items. Also Manageable from "Admin Dashboard > Appearance > Menus". From this place you get live changes for you menu settings. CLICK ON "Save & Publish" TO SAVE "Menus". CLICK ON "Save & Publish" TO SAVE "ARCHIVE SETTINGS". ​Add the language chooser widget to create the language option in header of your website as shown in above figure. For the block to show in homepage. ​Add the Subscribe Form or anything you like to to show in homepage Newsletter section just above portfolio section. Add the iframe code on this widget area in a text widget. Add Widget to show in right sidebar of the inner pages with sidebar layout selected as right or both. Add Widget to show in left sidebar of the inner pages with sidebar layout selected as left or both. Add suitable widgets to show in the "Footer Block One" as show in above figure. NOTE: Similar process can be applied for "Footer Block Two, Footer Block Three & Four"
Add suitable widgets to show in the "Above Footer Block One" as show in above figure. NOTE: Similar process can be applied for "Above Footer Block Two, Above Footer Block Three & Four"
Add suitable widgets for the "Above Footer Block One" as shown in above figure. CLICK ON "Save & Publish" TO SAVE "WIDGETS SETTINGS". Control the desire font family , color and font size for the typography options. ​Choose the fonts family from the dropdown for the heading text h1 to h6. ​Choose the fonts family from the dropdown for the body text. NOTE: Heading fonts and body fonts are overwritten by the stylesheet if they have property defined inside the respective child elements such as inside heading and body. ​Choose the body font size as integer value in the text field. ​Choose the body text color from the color picker. NOTE: This option gets override if they have specific color in the stylesheet. ​Choose text color from the color picker for H1 text. NOTE: Similarly, add settings for the heading text h1 to h6, this settings gets override if they have child element inside the heading element and if they have defined font size and color. 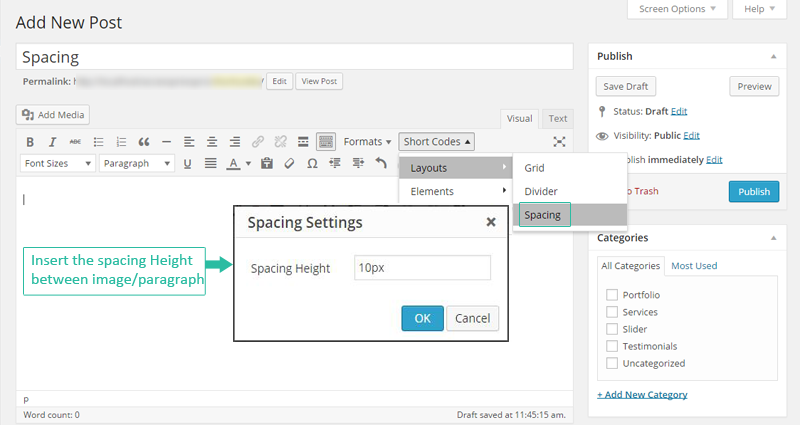 CLICK ON "Save & Publish" TO SAVE "TYPOGRAPHY SETTINGS". 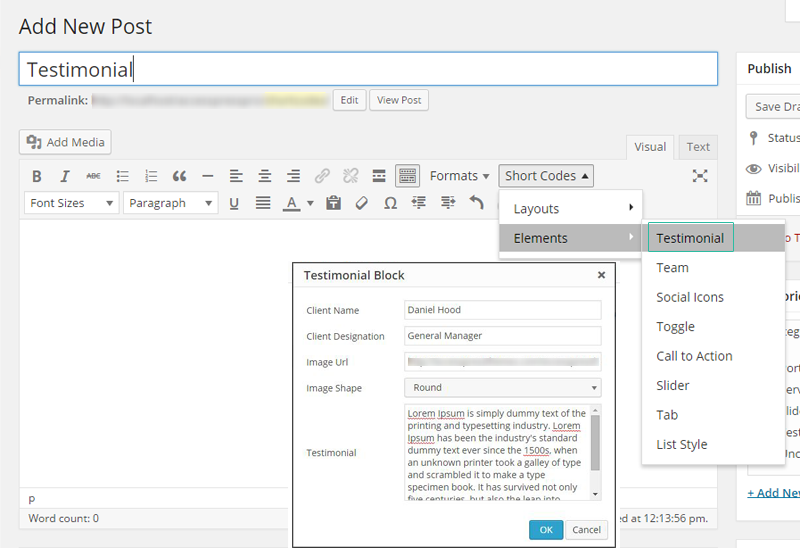 Write custom stylesheet for your website in the textarea of the customizer tools sections. CLICK ON "Save & Publish" TO SAVE "TOOLS". A grid is a series of vertical and horizontal lines that are used to subdivide a page vertically and horizontally into margins, columns, inter-column spaces, lines of type and spaces between blocks of type and images. Divider is a separator line. Spacing is blank space between images or paragraph. Insert the Spacing Height between images or paragraph. 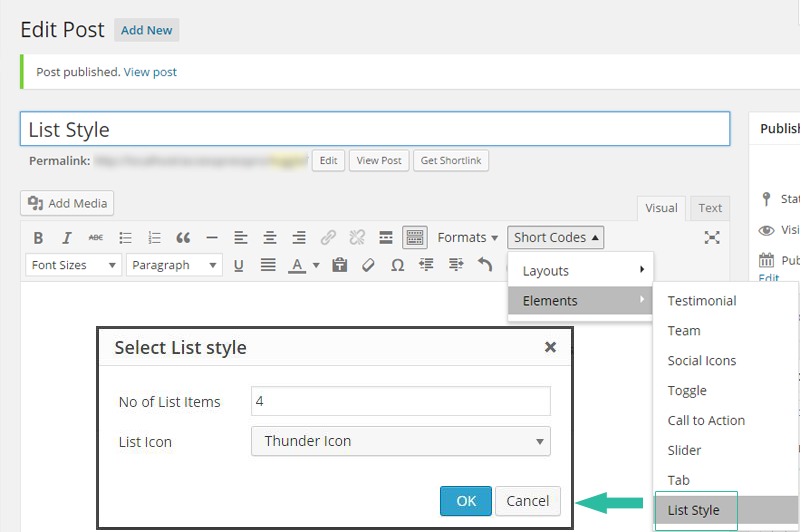 In Elements you’ll see eight options; Testimonial, Team, Social Icons, Toggle Call To Action, Slider, Tab and List Style. Select image shape to Round or Square as per your requirement. Select Open/Close option as per your requirement. Select Open Link to open In Same Tab or In Different Tab as per your need. Select Caption to show in Horizontal or Vertical. Select the List Icon from the list according to your preference. A complete WordPress resources club. WordPress tutorials, blogs, curated free and premium themes and plugins, WordPress deals, offers, hosting info and more. 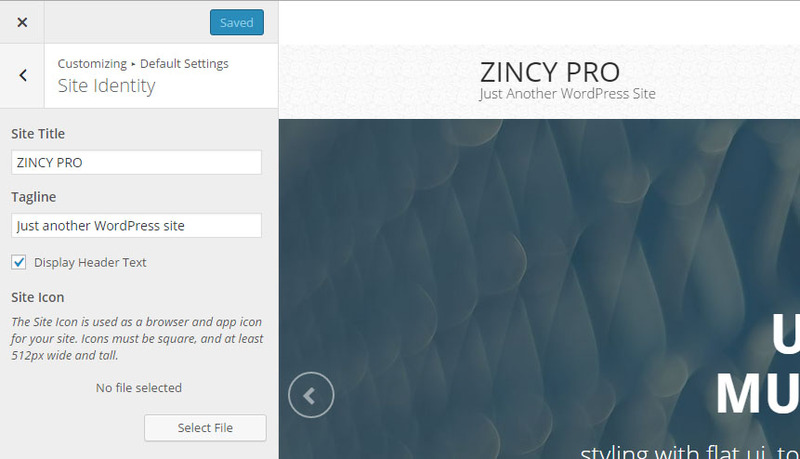 6 premium WordPress themes well suited for all sort of websites. Professional, well coded and highly configurable themes for you. 45+ premium WordPress plugins of many different types. High user ratings, great quality and best sellers in CodeCanyon marketplace. AccessPress Themes has 50+ beautiful and elegant, fully responsive, multipurpose themes to meet your need for free and commercial basis. 8Degree Themes offers 15+ free WordPress themes and 16+ premium WordPress themes carefully crafted with creativity. This Free plugin can be used for a website under construction, coming soon or in maintenance mode. The plugin is developed with all the basic features required to build a beautiful and secure coming soon. This Free plugin will help you to display an attractive notification in your website. You can notify your website visitors about your new releases, offers, messages, news etc through notification in your website. This Free plugin will allow you to display your instagram images different three layout masonry, masonry lightbox & slider. AccessPress Twitter Feed PRO is a Premium Twitter plugin for WordPress. It just takes a few minute to set it up and use. Start strong Twitter integration right on your website and increase your social reach to next level. AccessPress Social Icons PRO – allows you to create various social icons and link your social profiles from your website. Its fun because – you can create, customize and build the beautiful icons for your social media profiles on your own. Ultimate Form Builder is a PREMIUM WordPress Plugin which allows you to create unlimited responsive forms (single step or multi-steps). Anytype of forms (Contact us, Opt-in, Call-to-Action, Survey, Quotation, Enquiry or anything) can be built using drag and drop form builder. Unleashing the combination of extensive features of free twitter auto post and facebook auto post into one in addition with many more integrated features is AccessPress Social Auto Post. It is a perfect WordPress plugin to auto post all your website content to social media (Facebook, Twitter, LinkedIn, Tumblr). Importantly you can configure multiple social profiles and post onto them, it means if you want to post the content to more than one Facebook account you can! You just need to configure multiple accounts, and yes unlimited!